Update: With 54% of the vote counted, right wing candidate Ivan Duque has been elected President of Colombia. Really disappointing. Both candidates had a female running mate. Marta Lucía Ramírez will be the first female VP of Colombia. (Had Petro won, the VP would have been Ángela María Robledo. As of the results so far, Duque won in Medellin by 500,000 votes while Petro won in Bogota by 400,000 votes. Saturday, for the first time, some victims of the decades of violence in Colombia met directly with FARC members at the Peace Talks in Havana. The victims told the BBC's Sarah Rainsford in Havana that they were listened to by the negotiators with a great deal of respect. The United Nations High Commissioner for Human Rights Navi Pillay praised the move, calling it unprecedented and a potential model for other countries dealing with issues of justice, peace and reconciliation. With 99% of the vote counted, President Juan Manual Santos has won the run-off election, 51% to 45%. Challenger Zuluaga has conceded. Santos even won Bogota this round. He won Bogota, the nation’s capital, with the largest number of voters, a change from the first round, when he placed third in the first round of the elections. 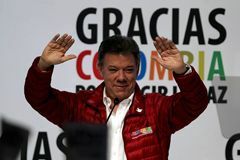 Santos also took the vote in the regions most affected by guerrilla groups, including the Putumayo, Nariño, Cauca and Norte de Santander states. With the Colombia run-off election 8 days away, FARC and the Government of Colombia reached another milestone in the Havana peace talks. Both sides agree the victims of the violence in Colombia must be heard. 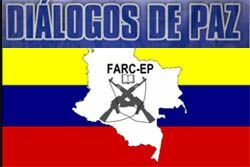 A truth commission will be set up, which FARC refers to as the "Commission of Clarification of the Origen and the Truth of the History of the Conflict." FARC has also declared a cease-fire for the next three weeks, through the election. Colombian President Juan Manuel Santos says the War on Drugs has failed and we need a new approach to drug trafficking. In an interview on Monday with The Wall Street Journal, Mr. Santos noted a softening of hard-line antidrug policies both in the U.S. and in Latin America. He said the world had to develop more "realistic and pragmatic" ways to fight drug trafficking. "How do I explain to a peasant in Colombia that I have to put him in prison for growing marijuana when in Colorado or in Washington state, it's legal to buy the same marijuana?" he said. "The world needs a more effective, fresher, more creative focus to win this war, because until now we haven't won, and the cost has been enormous."